We are all often told to try and stay security conscious online or when using applications that require secure access, and passwords is one of the most important parts of creating a more secure environment for yourself. It’s not unusual to end up with different login details for every site and program that needs it which is the most secure way. This is especially important when there are multiple users on the same machine as using a single password for everything could give someone access to your personal information very easily. With the possibility of so many different passwords to remember, it could become quite a nightmare trying to log into a website, email program or instant messenger etc, if it wasn’t for the ability to save them on your PC so you don’t have to remember them. These days, most browsers offer to store your login details for you, and there are some great dedicated managers around to centralize all your passwords such as Lastpass which makes filling in forms and logins even easier. Most applications will also store your password, but often it’s still hidden behind asterisks in the programs settings. If the password is saved and stored behind asterisks or bullets, you can easily use a tool and hopefully show the password hidden underneath. Here’s 6 different ways to try and get to the password under the asterisks in your applications and on websites. It might only save you a few seconds over digging into the program or browsers settings, or it might mean you don’t have to reset your passwords online because the program won’t tell you what your password is. 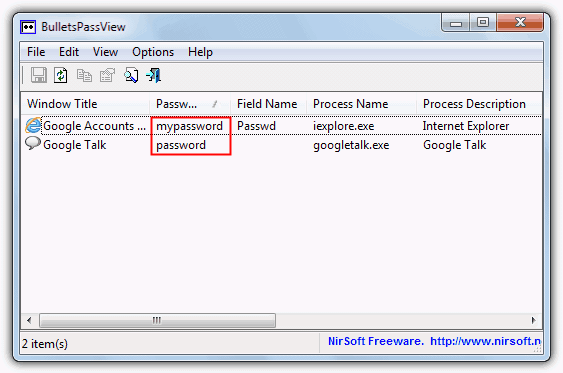 This is another one of NirSofts’s useful little tools and can show the passwords hidden behind the asterisks in a number of different applications including Internet Explorer. Some browsers and applications won’t work though because some of them don’t store the password behind the bullets, Chrome, Opera, Firefox included. Skype and Windows Live Messenger didn’t work either because the password box isn’t a separate input box in the window. As usual the tool is completely portable and simply run it to bring up the main window with a list of any currently opened windows and any passwords found inside them along with the creating process. If you open another password hidden window while the program is open, simply press F5 to refresh. A useful little function in the Options menu is the ability to turn the bullets inside the text box into the actual password, enable “Unmask Password Text Box” to turn it on, this doesn’t work in Internet Explorer though. Works on Windows 2000 and above, a 64-bit version is available. 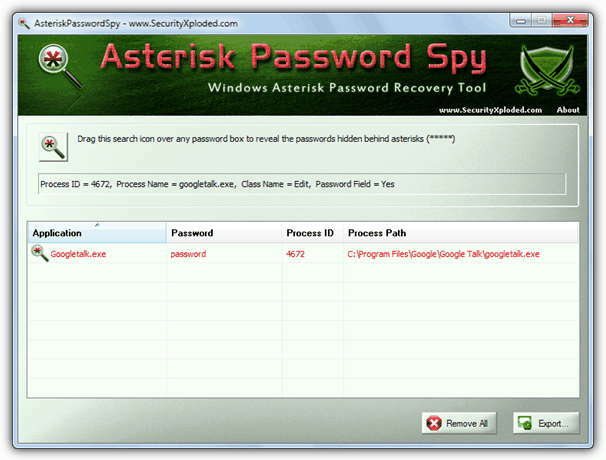 Asterisk Password Spy is a tool similar to BulletsPassView in that it displays the passwords hidden behind the asterisks in the main window, although in this tool you have to drag the icon over the password you want to reveal which will then show in the main window. There are a couple of drawbacks with this software though, firstly it only comes as a setup installer which will also offer adware during install, although you can easily get around both things and make it portable by extracting with an archiver such as 7-zip or similar. Unlike BulletsPassView it doesn’t appear to support Internet Explorer while the other browsers weren’t really expected to work anyway. It has its uses, but NirSoft’s tool is a far better tool to try out first. 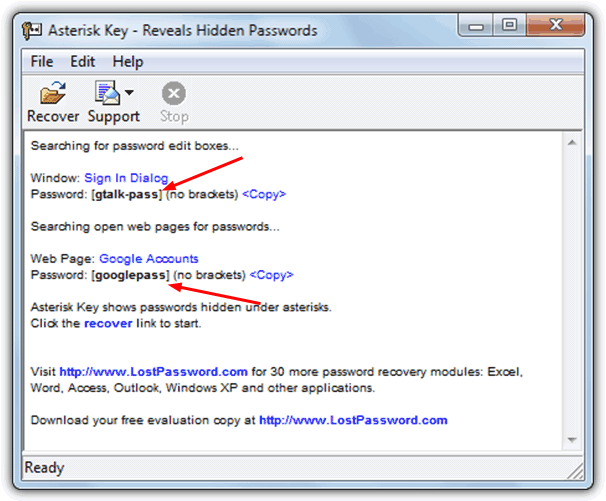 Asterisk Password Spy works on Windows XP, Vista and 7. Like the other tools listed here, Asterisk Key can show passwords hidden under asterisks but is slightly limited in what it can and can’t uncover. Although passwords from Internet Explorer can be shown, it seems to only be able to handle 1 tab at a time and gets a bit confused with multiple tabs open. Simply click the “Recover” button to search for any open password boxes and they will be listed in the window. We’re not sure why, but the text in the window seems to be rather small and could have been a few pixels bigger (the image above is enlarged 25%), and this program also needs installing although there is no adware during the install process. Extracting with 7-Zip can soon make the program into a portable one. It is easy to use though, and gives you an easy way to copy the password to the clipboard. Works with Windows XP and above. On the next Page we have 3 more interesting solutions to show the contents of password fields. And where are you trying to reveal the Windows logon password? OMG thank you so much! This is way easier than the add ons I was trying to download on an older Mac. Worked great! Just a tip: as of now (early November), this works on Safari (I’m using the newest version) and Google Chrome (also the newest version), at least on a Mac. Oh man.How did you find out such this thing. Its incredible. Discovery is the new name for ‘Raymond’..
Wow you are very good, Thanks its really great and helped ! Thanks you so much – you make day brighter! This is a great site. Thank you for your information. I THANK YOU I SALUTE YOU ITS AN AMAZING SITE. You are really a rare gem. I have been following your lines and they are true and are working. Keep it up.